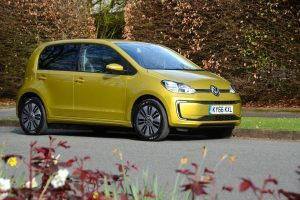 The Green Car Guide to the lowest emission and most economical city cars on sale in the UK today. We list our top fuel-efficient city cars in diesel, petrol and electric categories, updating the rankings on a regular basis. Each car is road tested by the Green Car Guide team and the reviews contain fuel economy, emissions, VED and BIK data. Fiat has been working on its TwinAir concept for some time and the fuel-saving results are excellent. You may be thinking at this point that all this efficiency will come at the cost of performance, but you would be wrong. The Suzuki Celerio is very economical with 58.8 mpg, and not bad to drive – it’s just somewhat behind rivals in terms of styling. 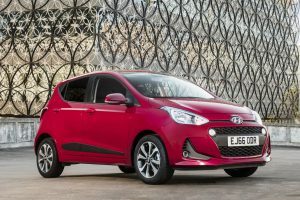 The new Citroen C1/Peugeot 108/Toyota Aygo (all based on the same platform) move things on from the last generation car in a number of areas including exterior and interior design, and fuel economy. They remain keenly priced and fun to drive. The new 3-cylinder engine is key to the up!’s excellent fuel economy and packaging. Its diminutive size allows the engine bay to be shortened leaving more room for people and luggage and keeping the overall weight admirably low. The i1o may not be as cheap as it once was, but it is a great all rounder with very low running costs and a free revving normally aspirated 3 cylinder engine helping it to stand out from the crowd. It has to be on your shortlist. 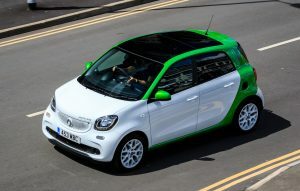 The smart fortwo is very cleverly designed and excels in the urban jungle. Just make sure you can live with two seats and the reassuringly expensive list price. 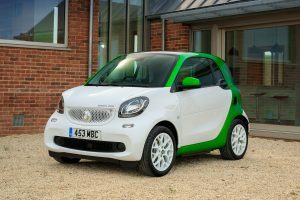 The fortwo ED is brilliantly suited to the urban environment, great fun to drive and in the context of electric city cars it is sensibly priced too. Due to its size it does have a limited range and only two seats but if it fits into your life it is a great city car. 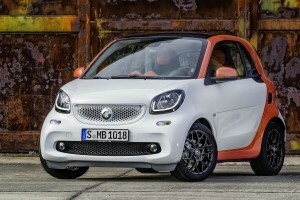 If you like the idea of the fortwo ED but can’t live with two seats, the forfour could be for you. It offers more space for minimal extra cash but disappointingly you don’t get any more electric range. In fact as it gets the same battery but weighs more the range is very slightly reduced! The Volkswagen e-up! is a conventional up! with an electric powertrain. It’s better to drive than the regular up! in our opinion, and one really good feature is the ability adjust the level of braking regeneration. Just make sure you can live with the short electric range. The Twizy is electric, rear-wheel drive, has two seats and not much else. Even doors are on the options list and if you specify them you don’t get any windows, so weather protection is minimal. The Peugeot/Citroen models are a welcome addition to the electric market. They feel solid and the clever design means that they are practical too, with no loss of interior space and a genuine four adult capacity.